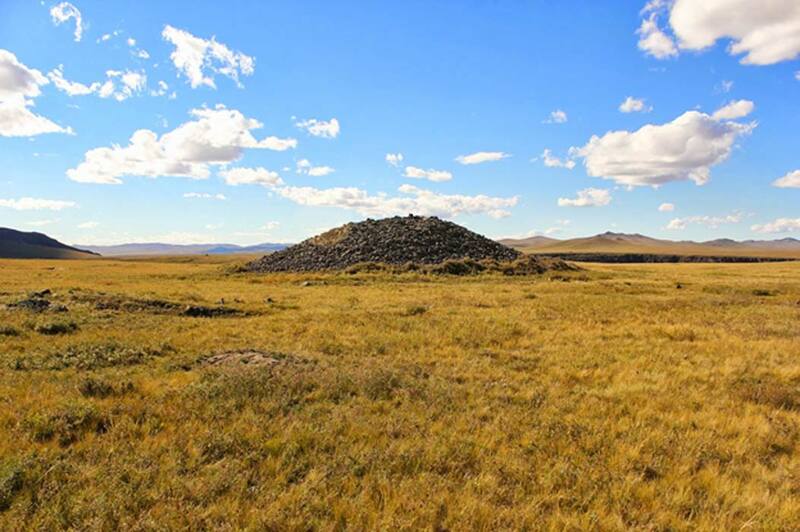 The history and archaeology of Mongolia, most famously the sites associated with the largest land empire in the history of the world under Ghengis Khan, are of global importance. But they’re facing unprecedented threats as climate change and looting impact ancient sites and collections. Mongolia has reasonably good laws regarding the protection of cultural heritage. But poor understanding of the laws, and the nearly impossible task of enforcing them in such a large space with relatively few people and meagre budgets keep those laws from being effective. And laws can’t protect Mongolia’s cultural heritage from climate change. Archaeologists’ interest in these burials lie in the information they contain for research, but this is worthless on the black antiquities market. But to steer looters away from these burials would be to teach them which ones to target for treasure and so this strategy is avoided. Archaeologists working in northern Mongolia in 2017 found hundreds of looted sites, including an 800 year old cemetery consisting of at least 40 burials. Each and every one of them had been completely destroyed by looters looking for treasure. Human remains and miscellaneous artifacts such as bows, arrows, quivers, and clothing were left scattered on the surface. Having survived over 800 years underground, these priceless bows, arrows, cloth fragments and bones likely have less than a year on the surface before they’re gone forever. This is not to mention the loss of whatever goods (gold, silver, gems) the looters decided was valuable enough to keep. Archaeological teams are currently working against climate change, looters, and each other for the chance to unearth rare mummies in the region that are known to pique public interest within Mongolia and abroad. A 2017 exhibit at the National Museum of Mongolia featured two mummies and their impressive burial goods – one of which had been rescued from the hands of looters by archaeologists and local police. Though they appeared not to have been particularly high ranking individuals, their belongings displayed incredible variety, artistry and detail. The result of natural processes rather than intentional mummification as in ancient Egypt, some of these mummies are preserved by very dry environments protected in caves and rock shelters. Others are ice mummies, interred in burials that were constructed in such a way that water seeped in and froze – creating a unique preservation environment. Both preservation environments produce artifacts that rarely survive such long periods of time. This includes human tissues like skin and hair, clothing and tapestries, wooden artifacts, and the remains of plants and animals associated with the burial. As looters zero in on these sites, and climate change melts ice and changes the environmental conditions in other yet unknown ways, archaeologists are racing to locate, and preserve these finds. But with little infrastructure, small budgets and almost no specialized training in how to handle such remains, there’s some concern about the long term preservation of even those remains archaeologists are able to rescue. There’s truth represented by a material record of the “things” left by ancient peoples and in Mongolia, the study of this record has led to an understanding of the impact of early food production and horse domestication, the emergence of new social and political structures and the dominance of a nomadic empire. ∫∫∫ On Earth we live in a DYNAMIC system (as opposed to a static system) so therefore there is always going to be “climate change”. That being said, since the early 2000’s there have been a series of brutal winters, even for Mongolia, that have decimated the livestock of many herders. This has created the situation portrayed in the article, as well as a large influx of countryside herders into the capital city of Ulaanbaatar. This has created its own set of problems, economically and environmentally (air pollution and sewage problems). But I would say there is more to the story. When hearing some of the old-school herders speak on this issue, they spoke of the younger herders being “lazy” and lacking the knowledge to survive such winters. Pasture rotation (hence the need to be nomadic) and other preparations must be made to get through extreme cold and wind in Mongolian winters. My personal opinion is that it is the introduction of TV and cell phones that is the main reason for this. I’d be out in the middle of the countryside and see TVs in many yurts (gers), and cell towers were being erected pretty much everywhere. I’m not against all technology, but we can now see how it softens up the population. The newer generations are a bunch of wusses compared to the older generations (me included). Oh and it’s Chinggis Khan not Ghengis Khan white girl. Don’t offend the Mongolian culture like that. I wouldn’t disagree that climate change is affecting Mongolians’ lives, especially herders’ livelihood. Desertification and unpredictable weathers are definitely happening. But I find it quite strange that the author relates the looters caused problems directly with climate change. I would say that a bigger and better relationship between these two problems she tries to tie together has more to do with the political shift occurred in the early 90’s in Mongolia.